This article by Shamus Cooke is re-posted from CounterPunch. With Syria on the brink of national genocide, outside nations have only two options: help reverse the catastrophe or plunge this torn nation deeper into the abyss. Countries can either work towards a peaceful political solution or they can continue to pour money, guns, and fighters into the country to ensure a steady gushing into the bloodbath. President Obama will have no talk of peace. He has chosen war since the very start and he’s sticking to it. A recent New York Times article revealed that President Obama has been lying through his teeth about the level of U.S. involvement in the Syrian conflict since the beginning. The President recently said that the U.S. government continues to give only “non-lethal” military aid to the rebels, but The New York Times revealed that the CIA has been actively funneling and distributing massive shipments of weapons to the rebels over the borders of Jordan and Turkey. This “arms pipeline” of illegal gun trafficking has been overseen by the U.S. government since January 2012. It has literally been the lifeblood of the Syrian “rebels,” and thus the cause of the immense bloodshed in Syria. So while Obama has repeatedly lied about “non-lethal” military aid, he has been personally involved in overseeing a multi-country flood of weapons into Syria, many of which are given to terrorist organizations. The only effective fighting force for the Syrian rebels has been the terrorist grouping the Al Nusra Front, and now we know exactly where they got their guns. If not for this U.S.-sponsored flood of guns, the Syrian rebels — many of them from Saudi Arabia and other countries — would have been militarily defeated long ago. Tens of thousands of lives would thus have been spared and a million refugees could have remained in their homes in Syria. The large scale ethnic-religious cleansing initiated by the rebels would have been preventable. But Obama is so intent on war that he will not even discuss peace with the Syrian government. He has repeatedly stated that there are “preconditions” for peace negotiations, the most important one being the downfall of the Syrian government, i.e., regime change. If a toppling of a nation’s government is Obama’s precondition for peace, then Obama is by definition choosing war. Never mind that Syria is a sovereign nation that should not have to worry about a foreign country making demands as to who is in power. Obama doesn’t seem to think this relevant. In fact, his administration has been very busy determining who the “legitimate” government of Syria is, by hand picking the “National Coalition of Syrian Revolution,” the prime minister of which is a U.S. citizen. One of the preconditions for being on Obama’s National Coalition of Syrian Revolution is that there be no peace negotiations with the Syrian government. Of course most Syrians want to immediately end the conflict in Syria, since it threatens an Iraq-like destruction of the country. The most popular leader of the National Coalition of Syrian Revolution, Moaz al-Khatib, recently quit in protest because he was prohibited from pursuing peace negotiations by the U.S.-appointed opposition Prime Minister, Ghassan Hitto, a U.S. citizen who had lived in the U.S. for the previous 30 years. By appointing Hitto as the leader of the opposition, Obama has splintered the already-splintered opposition while making “no peace negotiations” the official policy of the U.S.-backed opposition, the so-called “legitimate” government of Syria. Obama also recently pressured the Arab League — composed of regimes loyal to the United States — to install as a member the hand-picked National Coalition of Syrian Revolution as the official government of Syria. The appointment didn’t give as much credibility to the opposition as much as it degraded the Arab League’s legitimacy. The rebel’s seat in the Arab league implies, again, that the U.S. and its allies are fully intent on “regime change,” no matter how many people die, no matter the existing political alternatives. They will not reverse course. 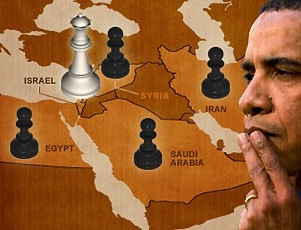 Obama rejects peace because he cannot dictate its outcomes. When it comes to war the more powerful party decides what the peace looks like, and Obama’s rebels are — after two years — still in a poor position to bargain a favorable peace to the United States, no matter how many tons of guns the U.S. has dumped into Syria. This is because the Syrian government still enjoys a large social base of support, something you’ll seldom read about in the U.S. media. Another sign of war lust from the Obama administration came after the Syrian government accused the rebels of a chemical weapons attack. The U.S. government initially dismissed the accusation, until the rebels later accused the Syrian government of the attack. But even Syria’s rebels have admitted that the chemical weapons attack took place in a government controlled territory, and that 16 Syrian government solders died in the attack along with 10 civilians plus a hundred more injured. But the rebels make the absurd claim that the government accidentally bombed themselves with the chemical weapons. No matter who is responsible, the Obama administration plans to hold the Syrian Government responsible for crossing the “red line” of a chemical weapons attack (Obama’s version of Bush’s infamous “weapons of mass destruction”). The red line refers to a direct military invasion, versus the prolonged blood-letting that has been U.S. policy so far. There is zero room for truth with logic like this. But the perverse logic serves to protect Obama’s prized rebels, who’ve committed a slew of atrocities against the Syrian population, and who gain key political and media protection from the U.S. Ultimately, the entire Syrian war was born amid the big lie that the battle began — and continues — as a popular armed struggle. But the real revolutionaries in Syria like the National Coordination Committee, have long ago declared that they want a peaceful end to this conflict. Obama’s Bush-like determination to overthrow the Syrian government has led him down the same path as his predecessor, though Obama is fighting a “smarter” war, i.e., he’s employing more deceptive means to achieve the same ends, at the exact same cost of incredible human suffering. Is Assad sympathetic to Iran and the Palestinians?